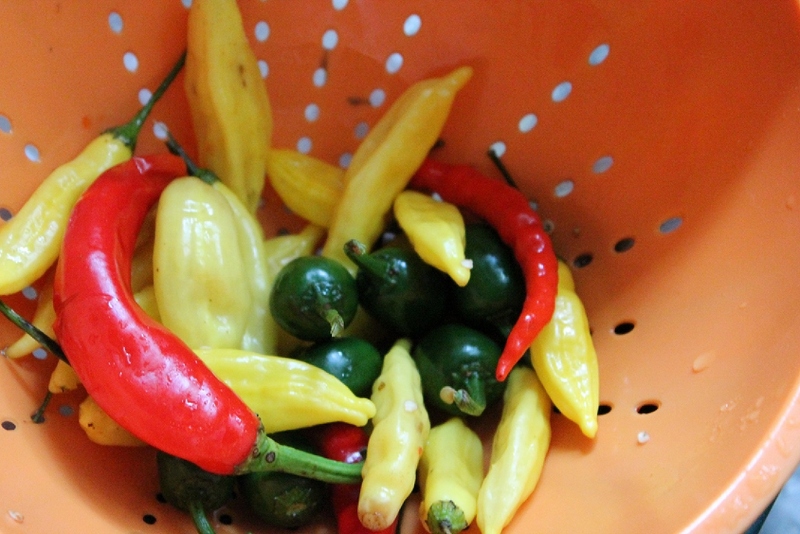 I take a variety of peppers and loosely chop them, leaving some of the seeds in for some heat. I like to add a few cloves of garlic, packing all of it into a jar. I cover the mix with a brine – I can never remember the salinity of the brine I make from year to year to be honest, but this year I did a tablespoon salt to two cups water. Something in that neighborhood works. Using the ghetto jar method, I make sure the food is all submerged under the brine. I cover it with a dishtowel and let it sit on the kitchen counter for 2-4 weeks. I then take the ferment, pop a lid on it and stick it in the fridge to sit for another 9 to 12 months. (Feel free to either let it sit on the counter longer or skip the fridge stop. Tabasco ferments in oak barrels for three years, so I go for a longer, slower ferment on this.) After the mix has been well fermented and aged, I take it out and dump it in the blender. I add vinegar until I achieve the consistency I like, bottle it and stick it in the fridge. It keeps for as long as it takes for you to use it up. I recently heard a variation on this that adds a cooked, mashed sweet potato to the fermenting mix of peppers, adding depth and sweetness. I’ll definitely be trying that now that I’ve seen some sweet potatoes coming in at the farmer’s market. Rachel at Fairweather Farm, suggested a hot sauce using the prolific lemon drop peppers I grew this year, pureeing lemon drop peppers (which have a citrusy flavor with their heat) with lime, carrots and ginger. (She says it freezes nicely too.) In years past, I’ve just pureed peppers with vinegar, but I find that fermenting the peppers really takes the sauce to another level. 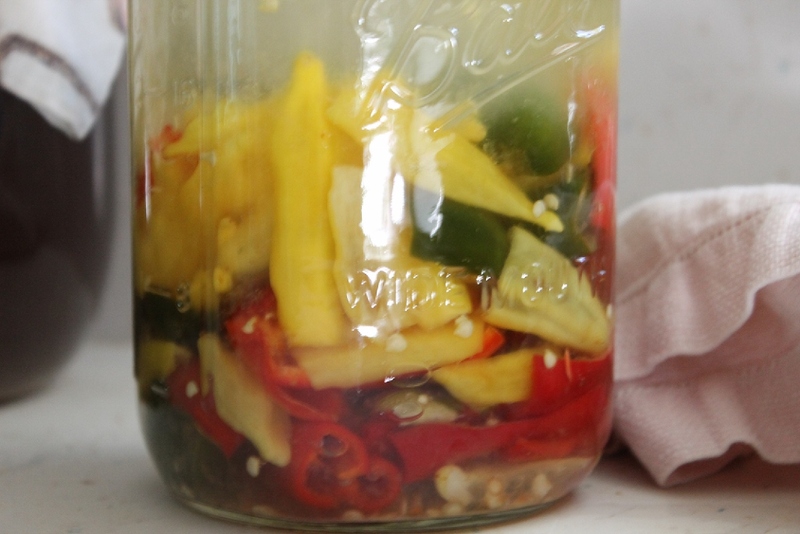 I also do a pepper vinegar, where I pack peppers into a jar or bottle, then cover with vinegar and let it set two to three weeks before serving. This is my husband’s go-to condiment and couldn’t be easier to make, which is always my favorite sort of recipe. I love pickles and relishes. All of these sound delicious. 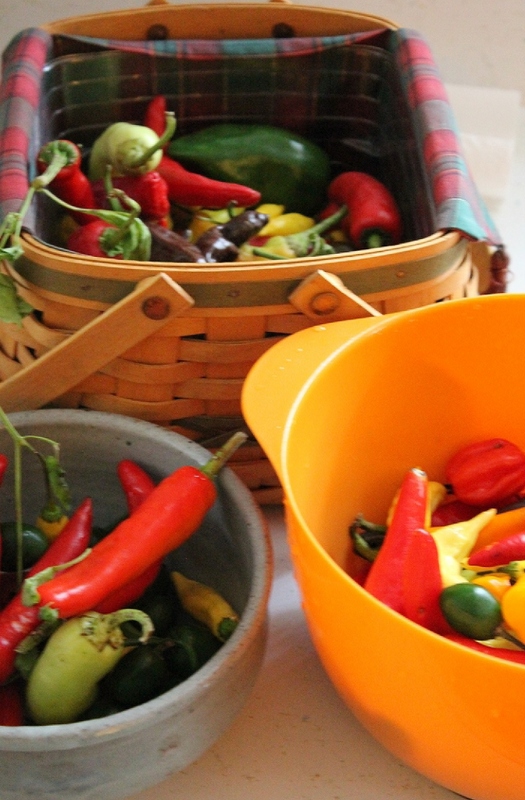 When life hands you peppers, you have to start getting creative…..
ahhh, this sounds so simple! I tried to make a fermented sauce one year, but I wasn’t wowed and I can’t quite remember why. But I like your method – I think I’ll get a hot pepper plant next year and try again.